It’s important to know who your customers are, the better you know your customers the more you will appeal to them on social media. What is their average age and gender? What aspects of online shopping do they value? Do they buy from competing businesses? If so, why? Find out which social media platform your customers use and develop a presence there. This will allow you to target specific audiences that may be valuable to your business. ask your customers in person. analyse and generate reports on your social media engagement. Decide what your username will be across all of your social media platforms and your website. Choose something that suits your brand, is memorable and easy to spell. This allows your customers to quickly and easily find you or follow you on multiple platforms. Remember, this will form part of your online business identity. If your website receives a lot of traffic, maximise the number of followers you have on social media by adding follow buttons on your webpages. This allows your viewers to quickly and easily follow you on social media and keep up-to-date with your business. Use content that is appropriate for the social media platform you’re posting to! 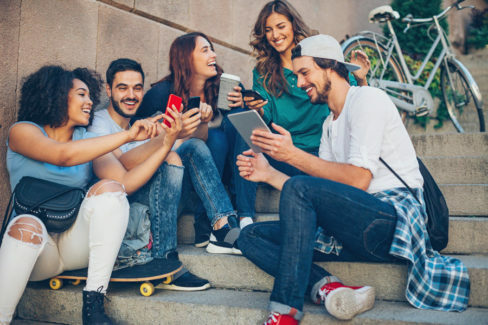 Remember, certain media platforms such as Facebook, Twitter and LinkedIn are better for connecting with people, while platforms such as Snapchat, Instagram and YouTube are more appropriate for sharing media. Engage with other businesses who a similar demographic and seek out opportunities for cross-promotion. By reposting content it shows you care about your online community and as a result their audience may eventually become yours. Give your customers a reason to follow you on social media, one way to do this is to provide exclusive content, products or discounts to your followers. Keep it simple! When writing content remember that your audience can range from amateurs to experts. Industry jargon should be avoided and if necessary, clearly explained to the reader. It’s also important to come across as a real person not a machine, add some warmth, personality and occasional humour to your posts and remember, it’s called ‘social’ media for a reason! Shared by Department of Industry, Innovation and Science.